Whether you are spending a day out in Shropshire or planning a longer holiday, here’s a list of more than 50 things to do in Shropshire. I’ve lived in Shropshire for most of my life, and it’s easy to take it for granted. But there are lots of exciting things to do in Shropshire, from exploring ruined castles to kayaking down the River Severn. We also have amazing landscapes, beautiful country houses, and some fantastic food festivals. You might not know much about Shropshire – it’s one of those places that people have heard of, but aren’t quite sure where it is. Lying on the border with Wales, less than an hour’s drive north west of Birmingham, Shropshire is one of England’s most rural counties. I also think that it’s one of England’s prettiest counties, but I am biased! Discover urban living from 2000 years ago at Wroxeter Roman City. Explore the remains of an Augustine abbey at Haughmond Abbey. Visit 12th century Lilleshall Abbey, which was ruined in the Civil War. Explore Wenlock Priory, much of which still stands high. See a Bronze Age stone circle at Mitchell’s Fold. Visit White Ladies Priory, where Charles II hid after the Battle of Worcester. See a descendant of the Royal Oak, which hid Charles II, at Boscobel House. Explore the ruins of a 12th century Cistercian abbey at Buildwas Abbey. Visit Stokesay Castle, the best-preserved fortified medieval manor house in England. Climb the tower at Ludlow Castle. Visit Clun Castle, sited on the Welsh border and ruined in the 13th Century. Visit Acton Burnell Castle, a 13th Century castle where parliaments were once held. Spend a day at the Ludlow Food Festival. Visit the Shrewsbury Food Festival – read about my visit here. Enjoy local produce at the Ellesmere Food and Drink Festival. Take in the sights at the Shrewsbury Flower Show. Visit the Newport Show – the county’s best one-day show! Enjoy a thrilling day out at the RAF Cosford Air Show. Enjoy a day out at Newport’s food festival, the Food Frenzy. Discover the food and drink of Oswestry and the Borders at Oswestry Food Festival. 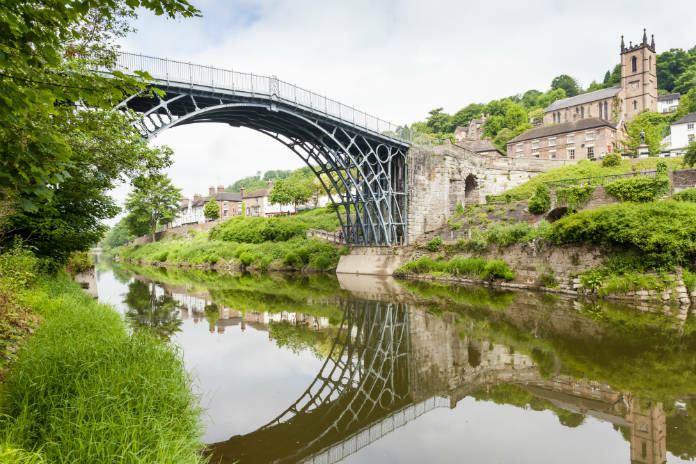 See the Iron Bridge – a UNESCO World Heritage site. Visit the RAF Museum at RAF Cosford. Visit the museum at Much Wenlock, the birthplace of the modern Olympic games. See the collections of the Shropshire Regimental Museum Trust at Shrewsbury Castle. Take a jailhouse tour at the Dana prison, Shrewsbury. Visit Shrewsbury Museum and Art Gallery and see the latest exhibitions. Get an insight into Victorian rural life at Acton Scott Working Farm. Go back in time at the Blists Hill Victorian Town. Discover the skills and artistry of Victorian tile makers at Jackfield Tile Museum. Grab a rare chance to explore the Town Walls Tower in Shrewsbury. See a replica of the Shropshire Mammoth at the Shropshire Hills Discovery Centre. Walk up the Wrekin and the nearby Ercall. Climb Brown Clee Hill – the highest point in the county. Walk the Stiperstones and see the Devil’s Chair. Climb to the top of the Long Mynd for amazing views over the county. Visit Hawkestone Park and see the 18th Century Follies. Walk through the woodlands along the Wenlock Edge. Climb to Caer Caradoc, site of Caractacus’ last stand against the Romans. Visit the Llanymynech rocks near Oswestry and see Offa’s Dyke. Take a ride on a steam train on the Severn Valley Railway. Take a trip on the River Severn from Shrewsbury on Sabrina. Go kayaking, canoeing or rafting on the Severn with Shropshire Raft Tours. Take a boat out on the Mere at Ellesmere. Take a walk, or a boat ride, along the Shropshire Union Canal. Ride on the Bridgnorth Cliff Railway, England’s oldest inland electric funicular railway. Watch the Newport Nocturne, the UK’s original floodlit cycle race. Visit the 18th century mansion and estate at Attingham Park. Explore the Elizabethan manor and gardens at Upton Cresset Hall. Visit Weston Park, a 17th century mansion with Capability Brown-designed gardens. Tour the house and gardens at Benthall Hall in Broseley. Visit the Rose Gardens and take tea at David Austin Roses. Have you done any of my 50+ things to do in Shropshire? Or do you think I’ve missed anything off my list? Let me know in the comments below. What a great way to showcase our wonderful county. Our guests staying with us in our luxury self catering cottages here Puddleduck Cottages throughly enjoy exploring Shropshire and often return because there is so much to see and do.